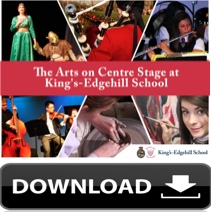 King's-Edgehill School | Oh, What a Night! We had our second annual “Arts Gala” on Thursday, April 4. The Gala is our chance as Arts teachers to celebrate the incredible artistic talent that we have at this School. The trophies were presented as the top academic awards in each discipline of the Arts. The Art pins were presented as acknowledgment to the students who are involved with more than two of the Arts, with one for work outside of the classroom such as helping with our Annual School Musical. We started the night with a reception and dessert, then on with the show! Mr. Seagram gave a wonderful welcome and then we enjoyed performances from all the disciplines of the Arts -- from videos, musical performances, dance numbers, and a scene from the Senior School Play. It was an incredible evening and a night to remember!